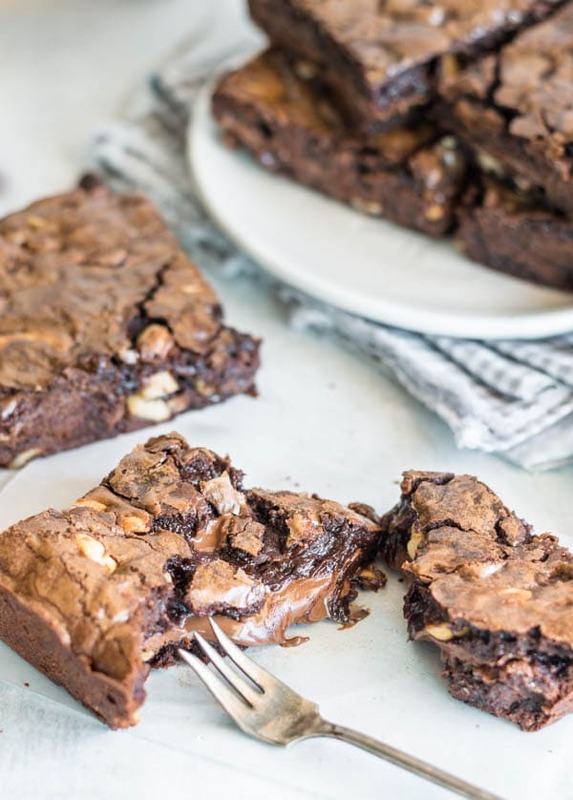 What would inspire someone to come up with a Cashew Nutella Brownies recipe? As a matter of fact, many things inspire me to create a recipe. Maybe it’s something I’m craving, for instance. Might be something a friend bakes and posts on instagram, or perhaps, the fact that I have to use up that last bit of cashews sitting in my pantry. In the case of these very fudgy brownies, all of those apply. I was craving for some after my friend Sheryl, from Sherbakes posted some delicious looking raspberry chocolate brownies on her instagram page @sherbakes. While I didn’t have any raspberries at home, what I did have was some Nutella and cashews in my pantry. This January, I’m going to visit my family in Brazil for a few weeks. So for that reason, I need to use up all of my pantry and freezer food. Since I had nutella in one hands and cashews in the other, I thought to myself: BROWNIES! Obviously that combining those two things with my basic brownie recipe seemed like a good idea to me. Don’t you agree? Without delay, here you have it. Now meet my brownies!! When I made this, I used my standard brownie recipe and not only did I add Nutella to it, I also added cashews to the batter. For the purpose of having a very gooey middle, I found wise to layer half of the batter in the bottom of the prepared cake pan. Then, I spread nutella over it, topped with the other half of the batter. And finally baked it! As far as plain brownies go, this recipe truly makes for the best, fudgiest, most delicious ones you’ll ever have. I would never lie to you and that’s for sure. If making plain brownies, just pour the batter (no nuts, no nutella) in a 9×9″ pan lined with lightly greased parchment and bake as is. In reality, any size cake pan will work for these brownies, but they will be taller or shorter depending on which size you pick, of course. 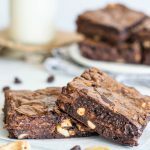 Or, instead of making plain brownies or these cashew nutella ones, why don’t you create your own version of brownies by using the standard recipe and adding whatever you want. By all means, you don’t have to use the cashews if you don’t want to, you can certainly skip them. However, I don’t see why you wouldn’t. After all, who doesn’t like cashews? Or you can even use different nuts. Such as walnuts or macadamias. But really, any nuts! I tend to use whatever I have in my pantry, for example, leftover nuts from a pie or cake I’ve made. And for the most part, I’m always pretty well stocked up on nuts, because I like them so much! If you’re not crazy about Nutella, you can skip that too. I actually know a couple of people who don’t like Nutella. Needless to say we aren’t friends. lol joking, one of them is my husband, who by the way, ate a multitude of these brownies, in spite of “not liking Nutella”! Just in case you want to use something else, you can use some peanut butter (probably not the whole cup that the recipe asks for though) or some jam, or even some dulce de leche. Simply drizzle a reasonable amount in the batter before baking, as much as you want to! Because they are so delicious and can be so versatile, brownies will never go out of style. In fact, I challenge you to bake some brownies and bring to some friends, or to your co-workers. When was the last time you baked brownies for someone? Not to mention, they don’t have to be plain brownies, or even these cashew Nutella ones. You can certainly add whatever you want. As long as they are brownies, and baked with love! Given that you probably like all things chocolate, since you read all the way to the end (thank you for that, by the way), you might also want to check out this Chocolate Bundt Cake (spoiler alert, it has a Raspberry Cheesecake Filling). 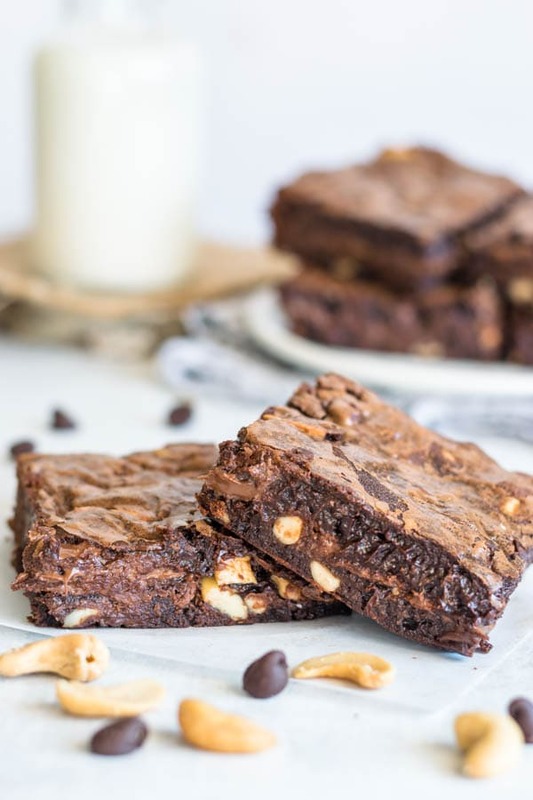 These Cashew and Nutella Brownies will blow your mind. 1 cup Nutella 226 grams or 8 oz. Pre-heat oven to 350F. Grease a 8x8” or 9x9” pan with butter. Line pan with parchment paper and lightly butter parchment. Melt butter and 1 cup of semi-sweet chocolate in a large bowl. I like to use a large glass bowl that I stick in the microwave for 30 second intervals and stir until everything is melted together. Add sugars to melted butter and chocolate and whisk until incorporated. Add eggs one at a time and whisk until incorporated before adding the next egg. Add vanilla extract and whisk. Mix flour, cocoa powder and salt together. Add to batter and fold with a spatula until incorporated. Add chocolate chips and cashews and mix. Add half of batter to prepared pan. Spread 1 cup of Nutella over batter. Pour rest of the batter over Nutella. Bake in pre-heated oven for 20-25 minutes. Let it cool, cut into pieces and serve. Ca, você é talento puro!!!!! you know it, Mike!! They’re the best!!! WoW!! These are so gooey and fudgey!! Can never resist any recipe with Nutella! And cashews are my favorite nuts! This looks like the ultimate brownie recipe!! Bada Bing! These look amazing! I never say no to Nutella! What a coincidence! I have cashews and nutella in my pantry begging to be used too!! And these brownies look like the PERFECT way to do just that! Seriously, these look amazing! Can’t wait to try them! Cheers! These look so wonderfully chocolate-y and rich! I’d definitely add the Nutella and cashews because I love a brownie with plenty of extras :). Hope you had a happy New Year! Starting the new year with this great recipe. So glad I tried this link. Have a great day. 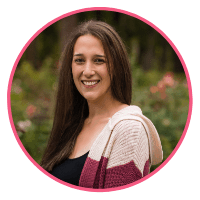 Your blog is very nice. Well done. This recipe looks gorgeous. I will try your recipe using my home made chocolate paste instead of nutella. Camila, these look so fudgy and delicious. And I love the addition of Nutella and cashews! Hope you’re having a great weekend! HAHAHA BADA BING HHAHAH!! Seriously Camila, you always put a smile on my face whether it’s your cranky jokes. funny sounds used to describe food or your awesome bakes. Ahhhh How did I not notice you actually had so many droolworthy photos taken of your brownies. BADA BONG! Awe thanks my friend!!! you’re the best! !